Am I the Right Squamish Web Designer / Developer for You? The tendering process is hopelessly flawed, because it views a website as nothing more than a commodity. Choosing the lowest price for the longest list of perceived features is the same as picking the cereal box at the supermarket, with the most features advertised on the box, at the lowest price. The question that should be asked is whether that website — or box of cereal for that matter — is actually good for you. Enough unhealthy boxes of cheap sugary cereal will probably kill you, and choosing a web design or re-design for all the wrong reasons will almost certainly hurt company profits. A Website's Value I believe that a website has no intrinsic value in itself. Throwing a new skin on the same content that failed to deliver before is akin to putting lipstick on a pig. If your re-designed website doesn't bring in a steady stream of qualified visitors, and then convert those visitors into buyers, it's been a waste of time, effort and money. Over 95% of all small business websites would qualify as "useless", or even worse, as liabilities on the balance sheet. * Most web re-designs aren't warranted, and what the company actually needs is a complete revamp of the content that's not working for them. That's something we could talk about. What is a "good" website then? A good website will deliver a solid return on investment. The net profit realized on sales, that can be directly attributed to the website in the first year, should exceed the cost of the website. A functional website presents content in such a way that it attracts qualified visitors, and the marketing copy is written in a way that it converts those visitors into buyers. Good web design is all about presenting the right words, to the right people and the search engines, in the most effective way. It's good copy and content that actually grow your business, contributing to profits, not overhead. The internet is not an art show, and your visitors and Google could care less about "design". Content Strategy / Planning A sitemap is created, to map out your website's architecture. A functional specification document is prepared to set out in detail everything the website must do. I then create wireframes (simple visual layouts) of each of the page types I will be building. I'll outline the content strategy we'll use to earn search engine rankings, attract quality visitors and subscribers, and the copy that needs to be written to convert visitors into customers. An effective website is not a 'set it and forget it' proposition; it involves a commitment to the process. Design In the design phase I produce mock-ups in Photoshop, based upon all the requirements approved in the Discovery process. Mock-ups are reviewed by you and refined/revised until approved. Upon sign-off on the design, the project is ready to move to production. Production (Web Development) In the production, or "code" phase of the project, the approved design is converted from the Photoshop (PSD) layouts into a functional website. I build sites on our local server. Upon completion, I provide a video walk-through of the entire site, with commentary. (On local projects, I can bring the laptop server to your office.) Upon approval, the website is completed, and it's ready for population with content. When the content has been entered, there's a final approval by you, and the new site is launched. The development process typically takes about 10 to 15 days, and starts at $2,000 CAD. Where there are more than the standard templates, add-on components like e-commerce, or special features, the process can take a bit longer, and that will affect the price. Content Populating your pages and blog posts with content can vary greatly from project to project, and therefore is separate from the design and development process. On most ROI-centric web design projects, I am also hired as the copywriter, and will provide a quote for the initial content and then also release regular content as the content strategy is rolled out, under a retainer agreement, for months or years to come. If you're looking for a slick pitch, low price, and about the same results you've become accustomed to, I'm not your guy. I'm not going to come in with the lowest bid, and we'd be wasting each others time. But if you're looking for a seasoned online marketer who can help grow your business, I'm probably the person you want to work with, and we should begin the discovery process. * Note: I have designed and developed quite a few custom websites, where there was no content strategy, but I'm not likely to be one of the lowest bidders in that space. I simply can't compete with offshore outsourcing and so-called "designers" who actually buy and use off-the-shelf themes. I have assembled/configured sites with off-the-shelf themes, but do not believe they serve the customer well. To make a theme 'universal', it must be able to work in many different applications. Providing all that 'flexibility' generally leads to 'code bloat', which can make the site load very slowly, and it can also negatively impact search engine rankings. As a website owner or content creator, WordPress allows you to edit the pages and blog posts of your site as easily as a Word document. WordPress is the number one CMS (content management system) platform in use today. 23% of the web runs on it. Free regular update releases from WordPress keep your site safe and up to date. Headway allows us to design a custom site, just for you, in a very efficient way, and it takes WordPress to a higher level. Many do-it-yourself website owners are already familiar with Headway Themes. For about a hundred dollars (Business), they could purchase the Base theme and select a common layout. 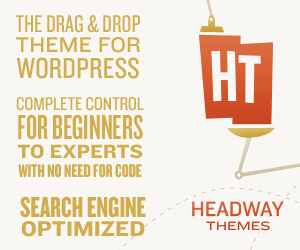 For the professional developer, Headway offers a lot more. Not everyone wants a cookie cutter design solution already in use on countless thousands of other sites. For a small business, branding, consideration for targeted user personas and the company's conversion strategy generally call for a unique design. That's where we come in. We create very affordable custom designs for bloggers and small businesses that want their own unique layout and branding. Like it or not, the internet is going mobile. Mobile use for small business is at 60%. Google's April 21, 2015 "mobile-friendly" algorithm update is designed to rank only websites that provide a quality user experience for all devices on the first page of results, and responsive web design is usually the most cost effective approach to delivering that experience. All of our projects in 2015 are built responsive. Basic responsiveness includes scaling of items like image sliders, photos and content areas, with shifting of widget panels as required, and a basic mobile menu at cell phone resolutions. Training tutorials On a custom WordPress/Headway project, we include tutorial videos actually created on your site. You will learn how to add and edit web pages, and blog posts. Where applicable, you will be taught how to update image slider and gallery images. We will also address updating core software and plugins, as new versions become available. Discovery On a custom web design/development project, we begin by discussing your needs, goals and vision, your target market and content requirements. A sitemap is created, to map out your website's architecture. A functional specification document is prepared to set out in detail everything the website must do. We then create wireframes (simple visual layouts) of each of the page types we will be building. Design In the design phase we produce mock-ups in Photoshop, based upon all the requirements approved in the Discovery process. Mock-ups are reviewed by you and refined/revised until approved. Upon sign-off on the design, the project is ready to move to production. Production (Web development) In the production, or "code" phase of the project, the approved design is converted from the Photoshop (PSD) layouts into a functional website. We build sites on our local server. Upon completion, we provide a video walk-through of the entire site, with commentary. Upon approval, the website is completed, and it's ready for population with content. It is usually then moved to a beta location, where content can be added and edited on a live server. When the content has been entered, the new site is launched. The development process typically takes about 10 days, for a standard 4 template WordPress/Headway website, and starts at $2,000 CAD. Where there are more than the standard templates, add-on components like e-commerce, or special features, the process can take a bit longer, and that will affect the price. Content Populating your pages and blog posts with content can vary greatly from project to project, and therefore is separate from the design and development process. On most ROI-centric web design projects, we are also hired as the SEO copywriters, and will provide a quote for the initial content and then release regular content, under a retainer agreement, for months or years to come. On other redesign projects, we are contracted to migrate all of the content from the former site into the new platform, and reconfigure it so it works in the new responsive design. And in other budget projects, the client will be creating and entering all of the content, so our role will only be design and development. This project was a 'technology' re-build. The new WordPress design was identical to the previous Joomla! 1.5 site we developed for them in 2011.